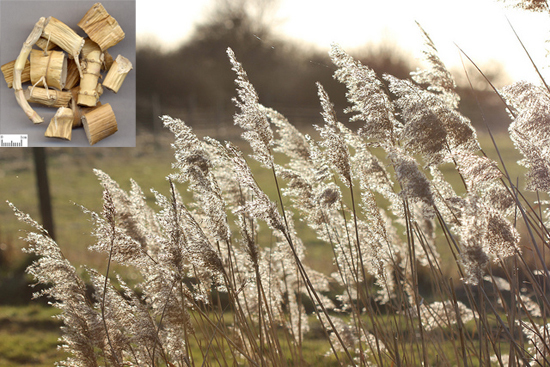 Common Name: Phragmites, Reed root, Reed rhizome. Part Used & Method for Pharmaceutical Preparations: The rhizomes are dug at the end of spring, in the beginning of summer or in autumn. After the fibrous roots have been removed, the skin is peeled off and cleaned and dried in the sun. Functions: 1. To clear heat and relieve irritability; 2. To promote the production of body fluids and relieve thirst; 3. To stop vomiting. 1. Febrile diseases manifested as thirst, irritability and fever. Reed root (Lugen) is used with Gypsum (Shigao), Ophiopogon root (Maidong) and Trichosanthes root (Tianhuafen). 2. Heat in the stomach with vomiting and belching. Reed root (Lugen) is used with the juice of Fresh ginger (Shengjiang), Bamboo shavings (Zhuru) and Loquat leaf (Pipaye). 3. For dark, scanty urine or blood in the urine, it is used with Rhizoma Imperatae (Bai Mao Gen) and Herba Plantaginis (Che Qian Cao). 4. Heat in the lungs manifested as cough, expectoration of thick, yellow sputum and pulmonary abscess. Reed root (Lugen) is used with Honeysuckle flower (Jinyinhua), Houttuynia (Yuxingcao) and Benincasa seed (Dongguaren). Dosage: 15-30 g dried; the fresh form of this herb has a stronger effect. Cautions & Contraindications: This herb should be used with caution in cases with cold and deficient spleen and stomach.